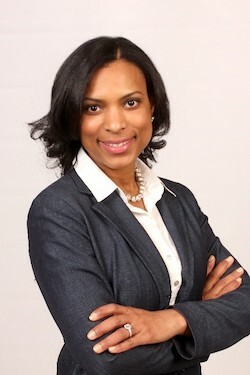 Volunteer Efforts and Other Affiliations: Co-Chairperson, National Association of African-Americans in Human Resources – Atlanta Chapter Young Professionals. If you’re familiar with NAAAHR’s Atlanta Chapter, you may know that three young professionals teamed together at the direction of chapter President Ardie Harrison to form the NAAAHR-Atlanta Young Professionals affinity group; better known as YP. 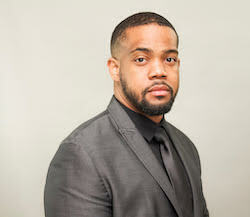 Members and friends, meet Atlanta native Rodrick Barnes; one-third of the triune that chairs NAAAHR-Atlanta’s YP group. We took some time to get to know some interesting facts about Rodrick and his new journey into HR. Tell us about your involvement in the NAAAHR Young Professionals. How did that start? How are you involved? Our great president, Ardie Harrison, saw three young individuals at one of the Monthly Chapter Meetings. It was our first night at a meeting and she asked us if we wanted to work together and form the NAAAHR-Atlanta Young Professionals group; more affectionately known as YP. 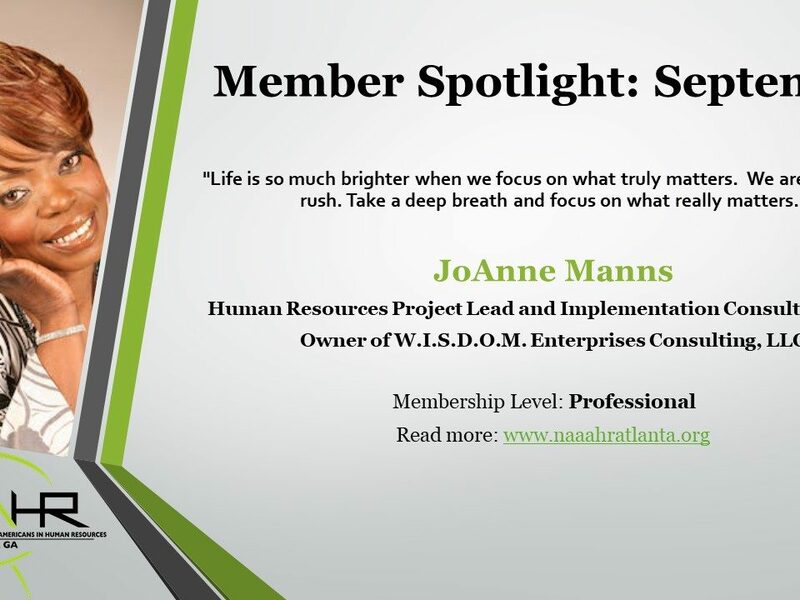 Since then, it has been exciting to develop YP into NAAAHR-Atlanta’s newest affinity group, focused on but not limited to ‘young professionals’ already in or looking to enter the HR space! We have brought in new faces and young professionals from entry-level and mid-level who are excited about YP and NAAAHR. What is your best professional memory/career accomplishments? It will be this December when I earn my Master’s degree in Human Resources. I had a “Come to Jesus” moment after I had several people tell me I would be a good fit in the Human Resources industry. Since then, I did develop a passion for HR. I’m still networking and trying to get my foot in the door. It’s not easy, but I know someone will give me the chance. How did you find NAAAHR? 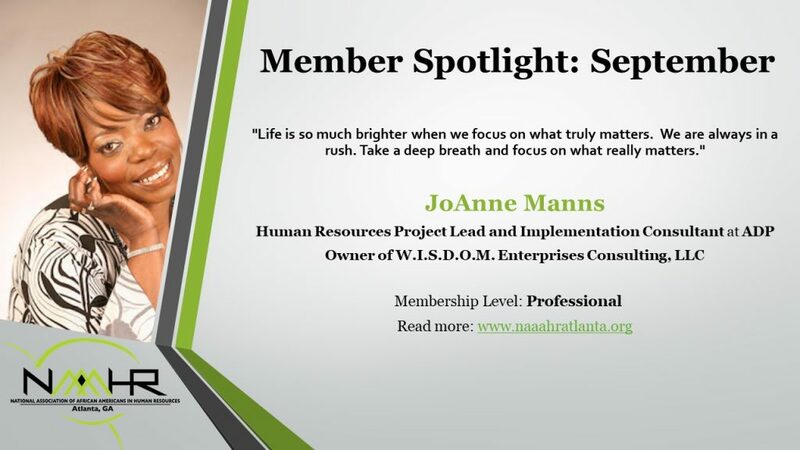 Discuss your experiences and how NAAAHR has been impactful to you in your journey/career? I just Googled “HR organizations” and came across NAAAHR. Since my first meeting, I learned so much in such a short period of time. 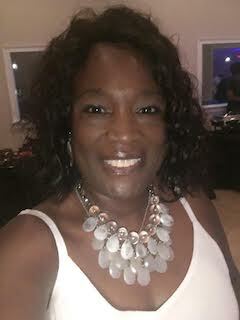 I have come across some great people personally and professionally. I thank NAAAHR because now I can hold a conversation and speak about the industry even in these early stages of my HR career. If not HR, what other career paths might you have chosen? What would be a dream job? If not HR, my dream job would be a Doctor of Plastic Surgery. I’m an Atlanta native and played the French horn in high school and college. What final words would you like to leave with other HR professionals? Thank you NAAAHR-ATL for giving me this opportunity! This organization has helped to me grow so much in such a short amount of time. I’m looking forward to many more years of membership and service. Also, if anyone is ready to bring on a young, bright, HR young professional with potential, I’m the guy for you and your company. Would you like to get to know more about Rodrick and some of our other Young Professionals? Or deposit a few pearls of wisdom he could use on his professional journey, post-graduation? Join us at our next chapter meeting hosted by YP where you’ll meet Rodrick and like-minded professionals in Human Resources and other fields on Wednesday, November 14, 2018, at our last formal chapter meeting of the year! Don’t delay, pre-register today and avoid the on-site registration lines. Be sure to also check out our calendar of upcoming events here.